Make every day a fiesta with the all-new Chemical Guys Horchata Air Freshener and Odor Eliminator! LIfe can always be a celebration with the fresh and amazing smell of Horchata! Now, it doesn 't have to be Taco Tuesday to enjoy the sweet scent of your favorite Latin drink. 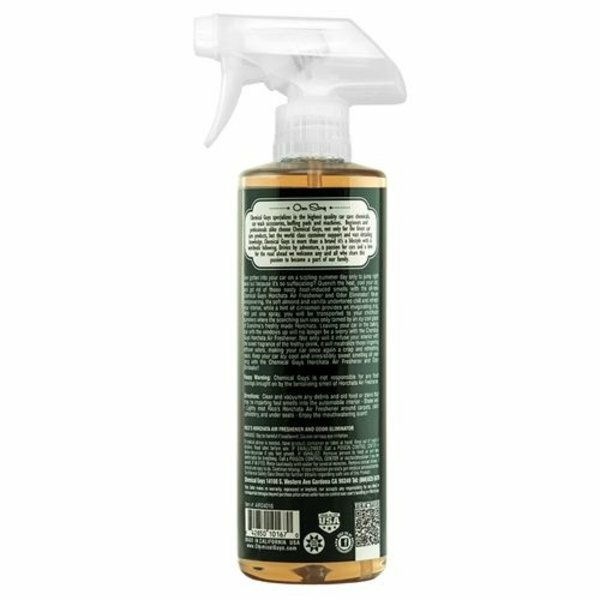 The soft almond and vanilla undertones of this premium air freshener will chill and refresh your stinky spaces while an invigorating zing of cinnamon and celebration! With just one spray, you can almost hear the mariachi band, feel the piñata bat in your hand, and taste the jalapeno slowly searing your tongue. Turn any old day into a fiesta and celebrate life with the deliciously sweet and sugary scent of Chemical Guys Horchata Air Freshener and Odor Eliminator! Real burritos aren't made for the weak... you ain't eating right if you ain 't sweating! Quality Latin food puts a little perspiration on your forehead, cleanses your sinuses, and makes your mouth tingle with that delicious burning sensation. When your mouth is on fire after a trip to your favorite Mexican joint or after trying abuelo 's secret salsa, the only thing to quench your scorched mouth is a glass of ice-cold Horchata. The sweet vanilla and almond beverage instantly extinguishes that 3 alarm fire burning in your mouth. 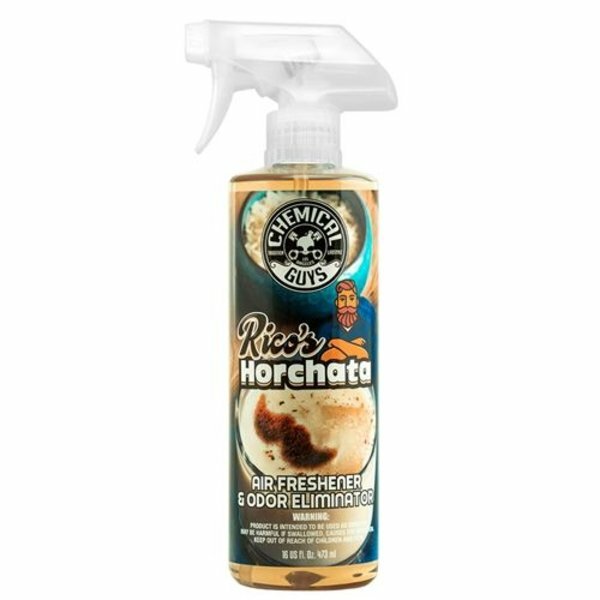 Now, with the Chemical Guys Horchata Air Freshener, you can get that same refreshing power for your home, office, and most importantly, your car! Your car 's cabin doesn 't have it easy. It sits outside all day baking in the hot sun, all closed up like a greenhouse while the interior plastics and fabrics bake to stinky disgustingness. Next time you have to leave your car in the sun, mist Horchata Air Freshener to instantly cool and freshen your interior. The delicious mix of almond, cinnamon, and vanilla scents will come together to leave your cabin a refreshing oasis instead of a stuffy and stinky sauna. That taco you enjoyed in your car yesterday was bomb, but the smell still lingers in your cabin and you've got a hot date tonight. You want to get rid of those old food odors, but how? Cheap air fresheners mask bad odors, mixing old and new scents to create hybrid Frankenstein scents that smell strange and confuse the nose. 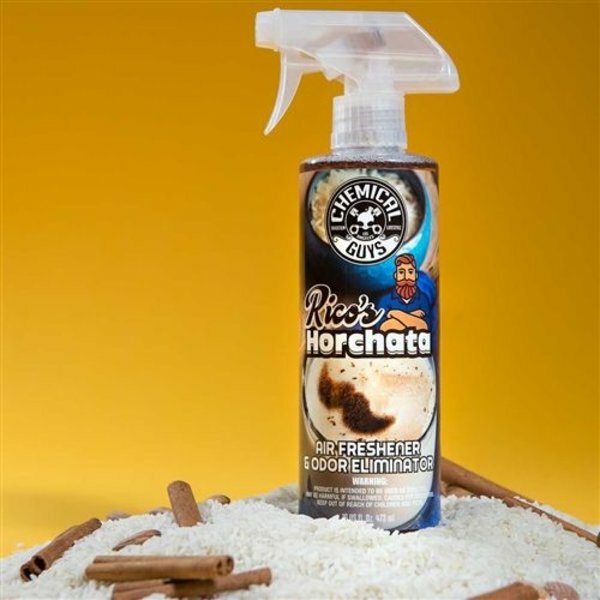 Horchata Air Freshener not only smells great, it also seeks and destroys old lingering odors to cleanse the air, creating a free and clear space primed and ready for the installation of the soothing scent of vanilla, almond, and cinnamon. When your interior suffers from foul odors you just can't shake, reach for Chemical Guys Horchata Air Freshener to create a whole new atmosphere and totally renew the space with sweet cinnamon scent! 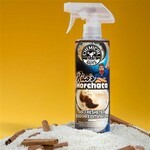 The delicious scent of Rico's Horchata Air Freshener and Odor Eliminator is also available in 4 ounce size.